Grown for their foliage rather than flowers, sagebrushes (Artemisia spp.) usually have finely divided or lobed silvery-green leaves. The flowers are small, and not showy. Several species of these woody perennial shrubs grow in the western U.S. Sagebrushes tolerate sun, drought and poor soils, growing in a variety of well-draining soils. Most perennial artemisias you're likely to find at a garden center grow in U.S. Department of Agriculture plant hardiness zones 3 through 8. Because sagebrushes regrow from the roots, you can remove these tough plants by digging them up completely or using herbicides to kill them. Native stands of sagebrush provide valuable wildlife habitats. One reason to remove woody sagebrushes is their flammability. Where they grow in dense stands near a home, keeping spaces between shrubs helps [revent wildfire spread. 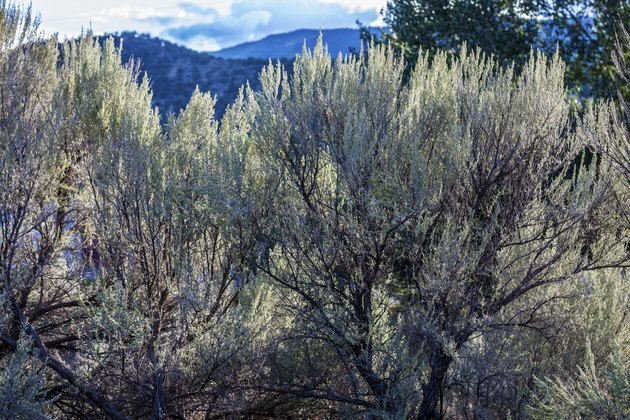 To remove a woody sagebrush such as big sagebrush (Artemisia tridentata), cut off the main branches near the ground and dig out or pull out the bush. Woody sagebrushes don't regrow from the roots. Hardy in USDA zones 4 through 9, big sagebrush grows 2 to 6 feet tall and 1 to 2 feet wide. Perennial sagebrushes usually have a somewhat woody base and can be cut back each year, regrowing from the perennial roots. This capability can mean that the roots as well as the above-ground growth need to be taken out if you want the bush gone. Some kinds of perennial sagebrushes, such as wormwood (Artemisia absinthium), can become invasive in some areas because they reseed easily. It will also regrow from root pieces. Moisten the soil, pull out the plants and dig up the roots and any root pieces. Check the area each year to remove any root pieces that have sprouted or any seedlings. Spraying sagebrushes with a ready-to-use glyphosate product that contains a surfactant will kill the plants. Surfactants help the product stick to the plant allowing full coverage. Spray the sagebrush during the growing season and when they are at least 12 inches in height, fully covering all portions. Apply on a sunny and windless day. Always follow product directions and wear safety goggles and appropriate clothing to keep the herbicide off your skin. Wash your hands thoroughly after using. Wormwood grows in USDA zones 4 through 9, and all plant parts can be poisonous if eaten, both to people and animals. Digging sagebrush plants from the wild isn't a reliable way to get the plants and it may be illegal. Get written permission from the landowner before attempting to dig up a plant. If you have permission to remove and relocate a sagebrush, choose a seedling, try to keep the root ball intact, and take as much soil as possible with the roots. Transplant in either the fall or spring when the ground is moist and temperatures are lower so the plant undergoes as little stress as possible. A better option is to purchase a nursery-grown container plant. Common names for sagebrushes include mugwort, wormwood and sage. You can also find cultivars developed for their positive traits. "Canyon Gray" California sagebrush (Artemisia californica "Canyon Gray") is a low-growing variety that reaches 2 feet tall and 10 feet wide, growing in USDA zones 7 through 9. It's suitable as a ground cover and in rock gardens. A European sagebrush, called southernwood (Artemisia abrotanum), has aromatic foliage and the plant grows to about 3 feet tall. It's used in floral arrangements and wreath-making, and is hardy in USDA zones 4 through 8. It has lemon- and tangerine-scented cultivars. Prairie sage (Artemisia ludoviciana), which grows in USDA zones 4 through 9, can be started from seed or cuttings. Remove these woody sagebrushes from the garden by digging out the plants.